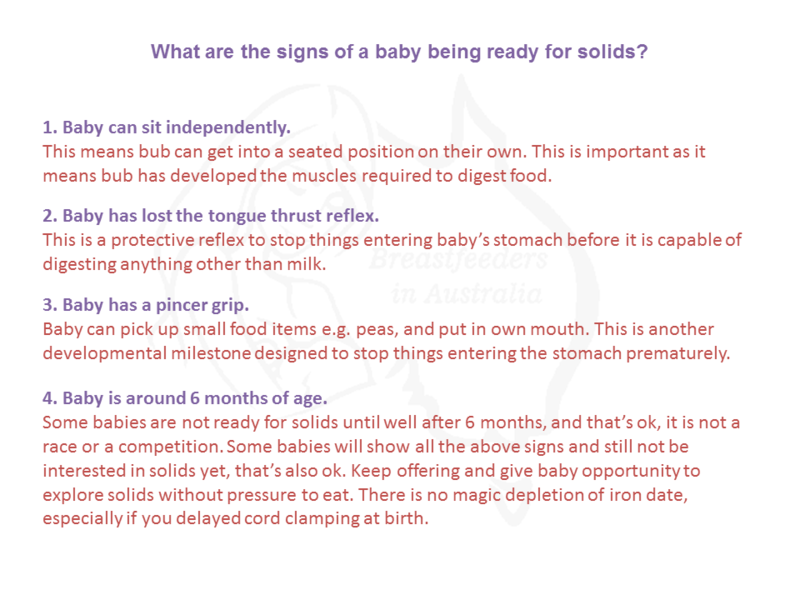 Are you excited to start solids? We see a lot of mums approach an arbitrary calendar date with an excited post about how they can’t wait and it’s only x days until they get to give their baby solids. This isn’t the way to approach what should be a developmental milestone. Rather, all the baby food marketing has us thinking that, magically, at 4, 6 or 8 months our baby should be eating huge volumes of processed bland mush, regardless of baby’s individual development. 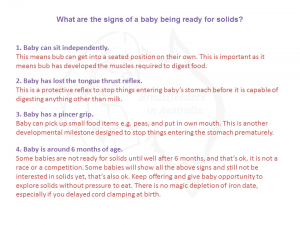 Baby’s individual development is often used as an argument against waiting until recommended minimum ages for introducing solids. We at BIA feel individual development should be used as the first measurement of readiness, rather than a calendar date. Through our research we discovered that sitting independently is one of the most important signs of readiness. It signals the abdominal muscles are sufficiently developed to be able to breathe, eat and sit at the same time. This doesn’t refer to propping baby up in a bumbo or highchair, it means baby is able to pull themselves into a seated position on their own from lying down. The second most important sign is the loss of the tongue thrust reflex. This is a physiological reflex to prevent foreign objects and food from entering the stomach prematurely. In the past, baby food manufacturers bypassed this reflex by making puree texture food, as this made it harder for baby to push back out of the mouth. The pincer grip is a skill that babies develop around the time that it becomes appropriate for babies to start exploring solids. Peas are a fantastic size for babies to practice their pincer grip, as they are baby ‘bite size’ and a soft texture once bitten. We see a lot of debate over solids starting age, not only in BIA but across many parenting groups. We have found that professionals tend to agree that parents are too focused on age, rather than individual readiness. As a general guide we like the WHO recommendation of “around 6 months of age” as most of the skills required would usually start to develop around that age. Lauren’s youngest baby was putting herself into a sitting position before 6mo, and walking at around 7mo, so there are the fast developers who acquire the skills much earlier. My youngest didn’t acquire these skills until around 10mo, she had a pincer grip earlier and had lost her tongue thrust, however her being able to pick up food and chew and swallow it did not mean she was capable of digesting it. Another friend’s baby showed all the readiness signs, but showed no interest in eating until around 9mo. All babies are individuals and do develop skills at different rates, so it’s more important that we learn about the signs of readiness, than debate about age.